Brandywine Valley Baptist Church’s Christian Education resources. Dr. David Lamb, Dean of Faculty and Professor of Old Testament at Biblical Seminary, will be leading a seminar on effective teaching techniques, leading a discussion and facilitating great group interactions around the Bible. This will be a great opportunity to develop and refine skills for teaching the Bible inside and outside the church. Dave loves to teach the Bible. This passion was developed during twenty years of ministry with InterVarsity Christian Fellowship, as a student at Stanford (BA, MS) and then on staff in LA and Philadelphia. Studies at Fuller (MDiv) and Oxford (MPhil, DPhil) further deepened his interest in the Old Testament. He has been teaching OT at Biblical Seminary in Philadelphia since 2006, and started blogging (www.DavidTLamb.com) in the spring of 2011. His dissertation, "Righteous Jehu and his Evil Heirs" was published in 2007 (Oxford). He also has two more popular books, "God Behaving Badly: Is the God of the Old Testament Angry, Sexist and Racist" (InterVarsity, 2011), and "Prostitutes and Polygamists: A Look at Love, Old Testament Style" (Zondervan, 2015). He became the Allan A. MacRae Professor of Old Testament in 2016 and the Dean of the Faculty in 2017. Week 10 of 10; Rev. Bo Matthews concludes the summer series celebrating the 500th anniversary of the Reformation by exploring four proposals regarding the function of doctrine. Pastor Bo is the former senior pastor of Brandywine Valley Baptist Church, with a Th.M from Dallas Seminary and a D.Min from Fuller Seminary. Week 9 of 10; Rev. Bo Matthews continues the summer series celebrating the 500th anniversary of the Reformation by exploring four proposals regarding the past. Pastor Bo is the former senior pastor of Brandywine Valley Baptist Church, with a Th.M from Dallas Seminary and a D.Min from Fuller Seminary. Week 8 of 10; Rev. Matthew McNutt continues the summer series celebrating the 500th anniversary of the Reformation by exploring the Puritans in New England. Pastor Matthew is the Pastor of Adult Christian Education and Student Ministry at Brandywine Valley Baptist Church. Week 7 of 10; Dr. David C. Hard continues the summer series celebrating the 500th anniversary of the Reformation by exploring the Puritans in England. Dr. Hard was a professor of Church History at Cairn University for 21 years, and is currently a full time missonary with SALT (Support And Leadership Training). Week 6 of 10; Dr. David C. Hard continues the summer series celebrating the 500th anniversary of the Reformation by exploring the Reformation in England. Dr. Hard was a professor of Church History at Cairn University for 21 years, and is currently a full time missonary with SALT (Support And Leadership Training). Week 5 of 10; Dr. Marilyn Button continues the summer series celebrating the 500th anniversary of the Reformation by exploring the life and impact of John Calvin. Dr. Button is a professor and chair of Languages and Literature at Lincoln University. Week 4 of 10; Dr. Lynn Okagaki continues the summer series celebrating the 500th anniversary of the Reformation by exploring the impact of the Anabaptists. Dr. Okagaki is the Deputy Provost for Academic Affairs at University of Delaware. Week 3 of 10; Dr. Lynn Okagaki continues the summer series celebrating the 500th anniversary of the Reformation by exploring the life and thoughts of Ulrich Zwingli. Dr. Okagaki is the Deputy Provost for Academic Affairs at University of Delaware. 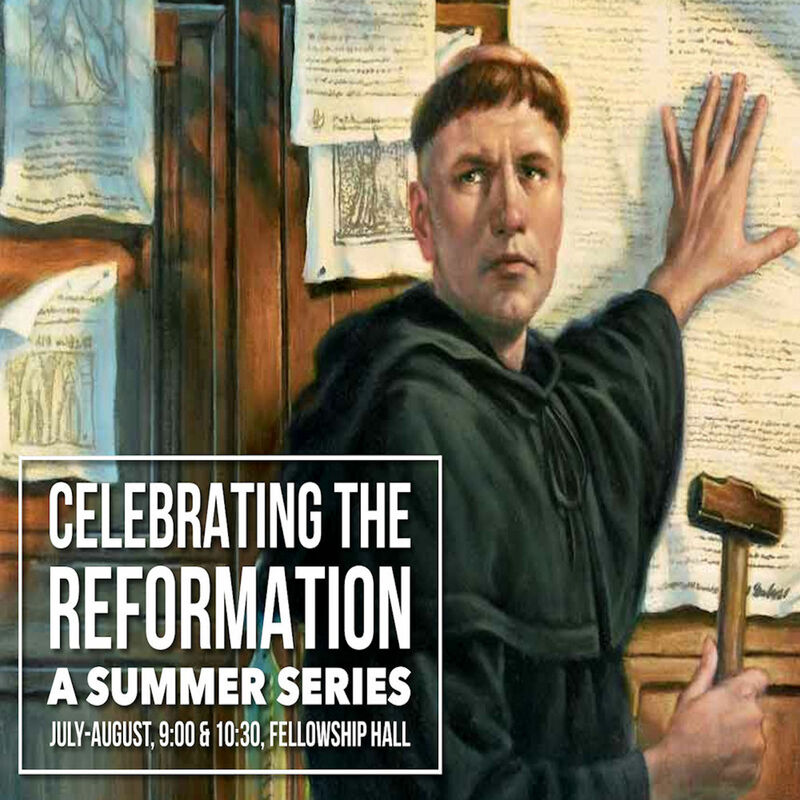 Week 2 of 10; Dr. Derek Cooper continues the summer series celebrating the 500th anniversary of the Reformation by exploring the life and thoughts of the most important of all the Reformers—and also the single most influential Protestant ever: Martin Luther. He discusses Luther's larger-than-life personality, his achievements, and his controversial legacy. Dr. Cooper is the Associate Professor of World Christian History and the Director of the LEAD MDiv program at Biblical Seminary.